Price Check- What's it Worth? Myoth, Aran.E99 and 10 Guests are viewing this topic. Re: Price Check- What's it Worth? I sold a bunch of these for $20. I may have been able to get more if I had known they were vintage at the time, but eh. Lolwut...I have 2 bare PCBs filled with WYSE cherry mx black switches. Cuantos cuesta? I sold 104 for $20 shipped, if that's any frame of reference. I was just going with the whole black switches are kind of unpopular thing. Got a smaller board with white ALPS, Montereys, Cherry Blues, Reds, or Clears you'd like to offload? Shoot me a PM. Looking for a grey Leopold FC700R in particular. Wyse buy colors were GSY for the dark grey, GBA for the light grey, and BBI for the fonts. 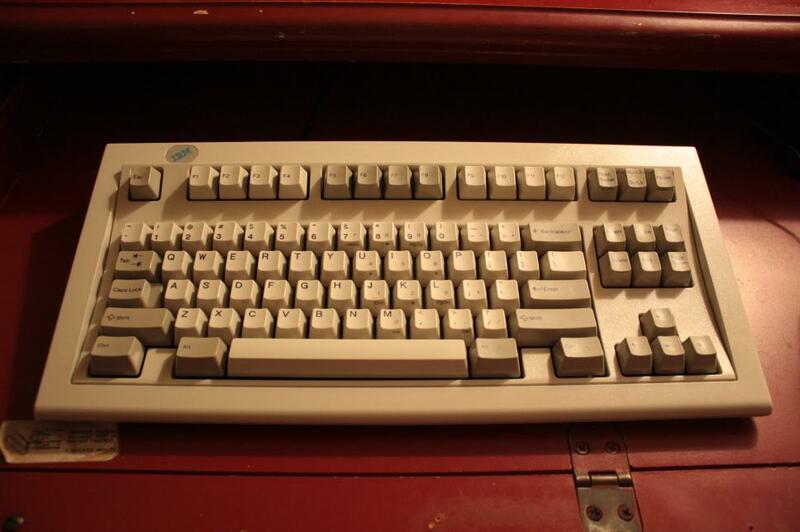 Do you think anyone would be interested in an IBM Model F XT which has been converted to USB and made compatible with modern PCs? How much do you think one would fetch? I had fun making mine and am looking for excuses to make more. Model Fs go for what, roughly $70? Throw a labor charge and shipping on there. How much I would say depends on the intensity of the work and how long it takes you. How much are the NIQMODS RGBY modifiers? COSMIC ESC key? I've for a Das Keyboard Professional with media keys (Blues) bought in 5/2010. It's well maintained and just has some shiny keys. I've recently bought newer keycaps (37 blanks from wasd keyboards) three months ago. The keyboard has media control keys which seems to only have been a limited thing. Ideally I'd like to switch to a TKL board with blues. Tired of that numpad yo. I think you could maybe get roughly $50-$60 for it. The recent sales of Rosewills for $60 drove down the demand for blue boards, but some people may be after the media keys. I'm salvaging parts from 3 old (late-80's to early-90's) Wyse boards. They come with Cherry MX black switches. I'll have 303 switches by the time I'm done. Wondering how much interest there is in vintage black switches? New and used prices if you can, I can't find anywhere to buy one. How much are these red, white, blue MX CC's worth? Check out my blog on touhou/doujin music, audiophile gear, and doujin games! to me? 18, 18 and 18.
i stand by my suggestion. A set of poker round 2s and a purple superhero v3? never doubt the power of the demik!!! I have an old Jarltech 8011. It's a programmable matrix keyboard with cherry blues. Cleaned, has all original cables and appears to be working. Has some very very worn plate mount Cherry MX Blues. Haven't used it except to test, so I figure it's time to move on! I had a sig once but it's gone. It used to display an icon of a Kinesis. Just imagine that. Looking for a price check on 356 MX-Mini with acrylic case. I no longer use this account. Please email me. Man... it's just getting passed around everywhere, isn't it? Isn't that 2 different keyboards? The MX-Mini and 356mini? ****, you're right. I meant MX-Mini not the 356 mini. $200 is the personal max I'd spend. Good to know, How much you think markup will be? anything over 190-200 is too much. hope jrock didn't take advantage of somebody. the koreans wouldn't like that..
What's the price for a 1 month old filco tenkeyless mx blue (only used for a week)? $400+ for Filco 104 Yellow Limited Edition - really?? I am looking for Cherry RGB kit (Shift, Control, Alt), so what would be a proper price for a set of Cherry made RGB caps, dyesub? And what for one of double shot? Double shot cherry made RGB are impossible to find. If you get lucky to find a person that has one and is willing to sell, it will be stupid expensive due to rarity. Dye sub cherry made rgb is around 100, if you find somebody. I imported this from Japan for around $200+very expansive shipping. Not to mention Ebay fees. Thank you for your interest. Nice 1800 spoila, I would say $100ish is fair price personally. In regards to the Cherry RGB, keep an eye out for the Desko bmol on ebay. I picked up one that was near mint for about $40 which had RGB mods and rest of set mix of doubleshots and whatever the other ones are not sure if also dye or pad print. Price check: current value for 140 lightly used mx clears pcb mount with diode? What are items that are equivalent to clickclack's Mint Green WASD Cherry keys? I was going to start a trade thread on GH but it went down. Now I can't even make a thread because iTrader isn't implemented and I have no posts . Am I being too hopeful for a skull? How much for a Ducky tenkeyless with brown and blue switches, the usb connector is broken. Hmmm... I guess I'm here again. how about my old apple m0110, with cord and box? They are seldom traded for money but if they are they seem to go for 100-200 USD. How much are old FACIT typewriters worth, either mechanical or electrical? Someone near my old folks has like ten of them, some of which are digital and record on tape. I couldn't take of any caps while they were there so I don't know which type of switch was inside, perhaps someone here knows. I took some pics but I forgot to bring a cable to my parents so I won't be able to post them until I get home, Tuesday. Model M spacesaver model 1370475, immaculate condition showing hardly any signs of use. Page created in 0.103 seconds with 72 queries.